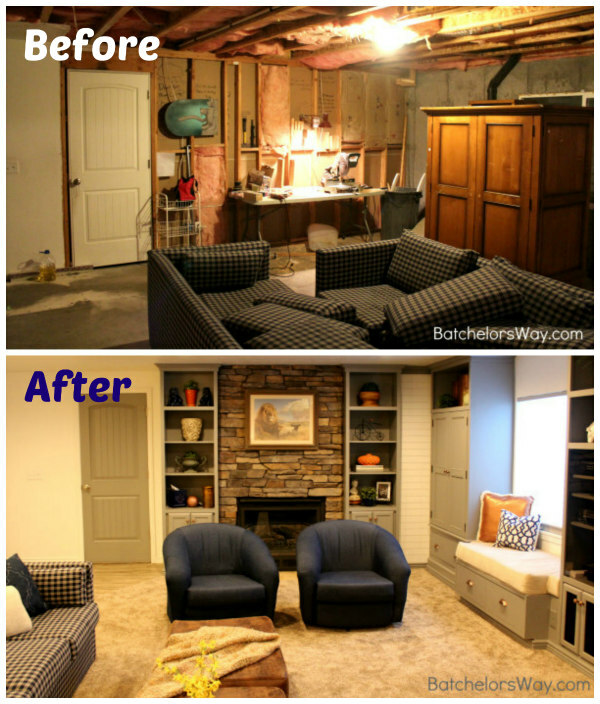 Batchelors Way: Basement Family Room - Reveal!! 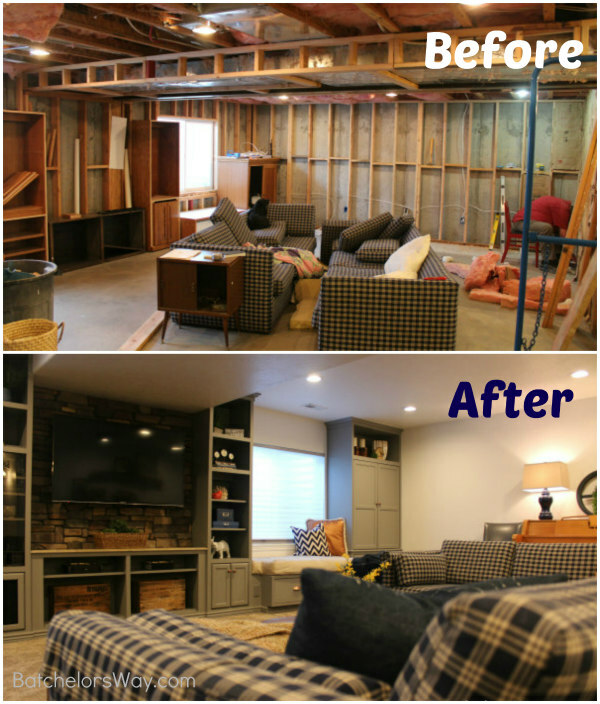 Basement Family Room - Reveal!! If anyone is still out there, I'm still here. and Life and people are more important than blogs. 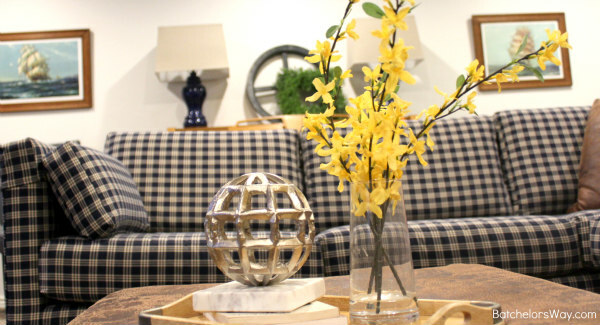 Today is the day I debut the Family Room!! 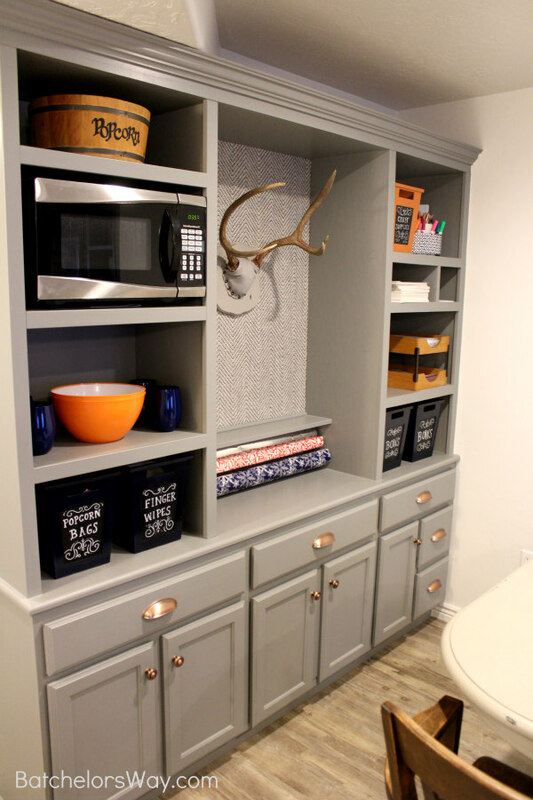 It is packed with lots and lots and lots of storage and style on a budget!! Let's just take a gander, and as always I will tell you how I did it all for less Money. 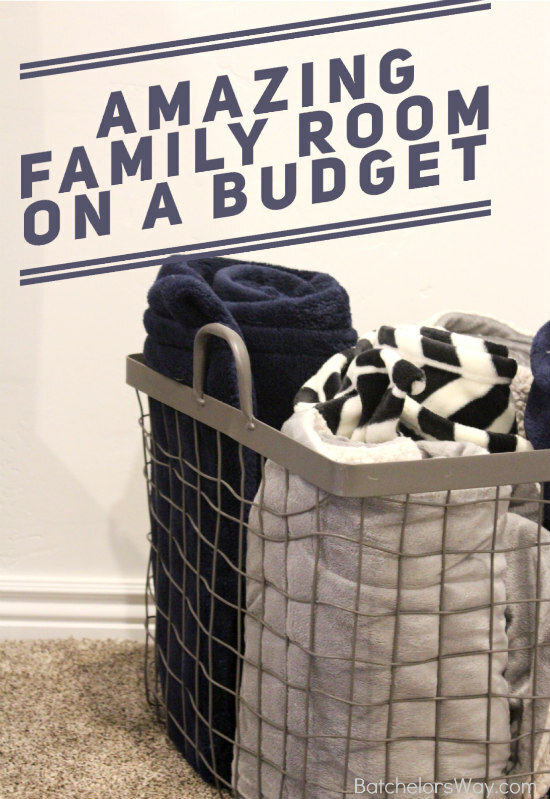 The cute blanket storage basket is from a thrift store. The grey blankets are also thrift-ed and the blue one was a large blanket I bought on clearance and cut in half to create two lap blankets. It gets chilly in the basement sometimes so a basket full of blankets is nice, especially when they match the decor. 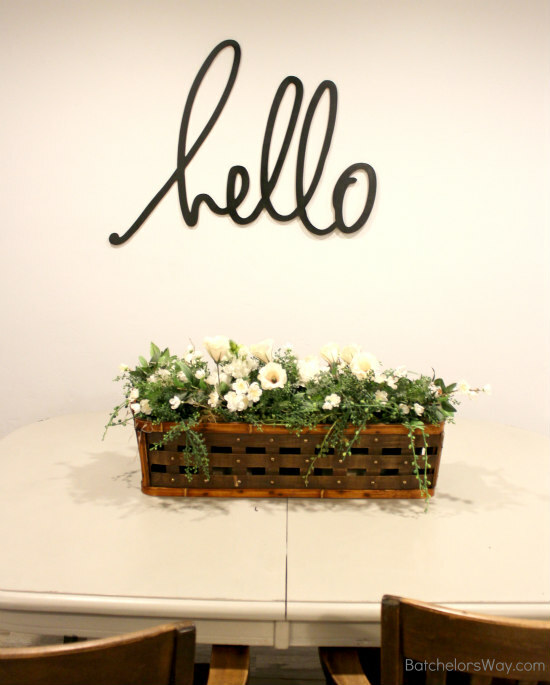 I bought the basket and flowers at a thrift store and repainted our old kitchen table. 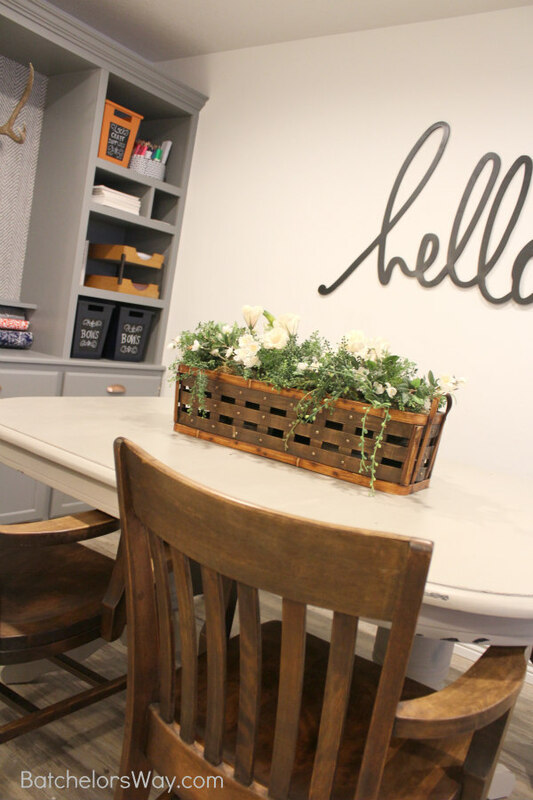 The chairs are from a yard sale and I won that "hello" sign at a blogger conference and painted it black. 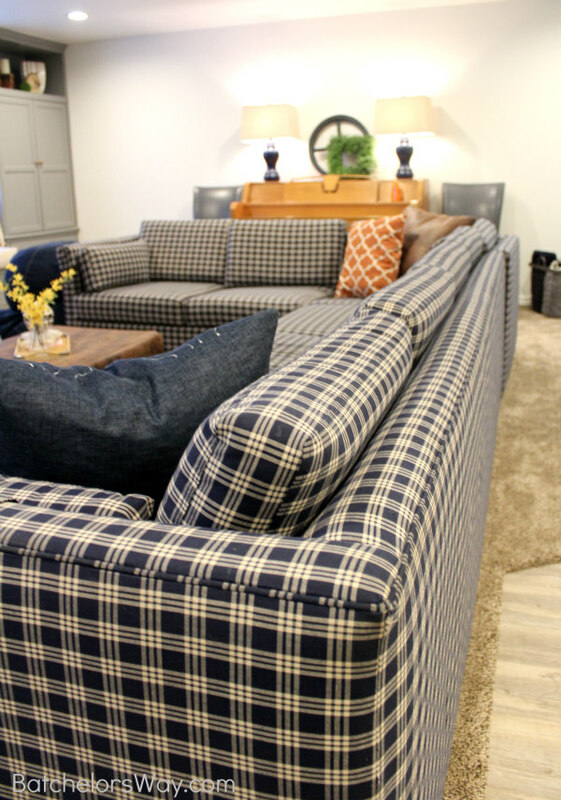 Our $50 giant sectional is from the Restore!! I just gave it a good cleaning. We also moved our piano downstairs. All the decor items in the forefront including the tray are from thrift stores. 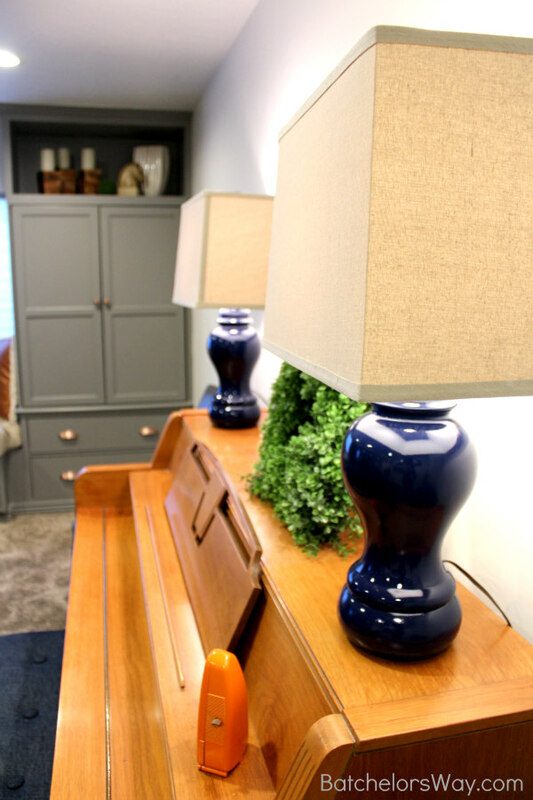 The lamps on the piano were given to me and I added a bun furniture leg to them to make them taller and spray painted it all navy blue. I topped them off with square shades I also found at a thrift store. I leaned a blue architectural piece against the wall with a square boxwood wreath all from thrift stores. Last of all I added two prints of ships, that were from an old store room at my in-laws and put them into thrift-ed frames. I did lots of orange accents around the room and I am in love with my metronome that I spray painted orange!! The fireplace was rocked with faux stones we bought at the Restore for $100. We sold what was left over for $100, so it was essentially free. Everything on the shelves was from thrift stores except the greenery. And remember, all the built-ins are from second hand pieces of furniture. 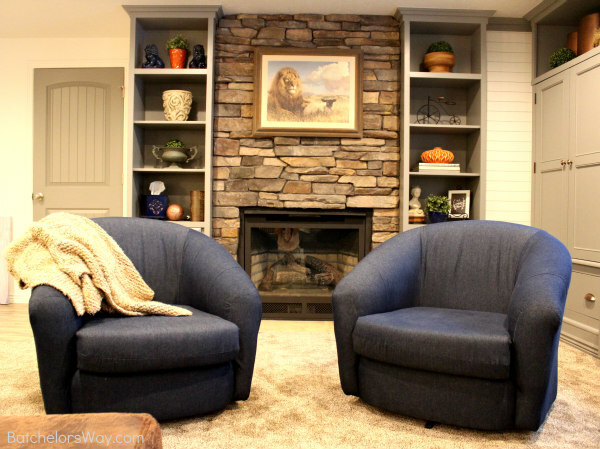 Oh and don't forget my lovely denim barrel chairs I recovered. These awesome rustic picture ledges I found in a pile of junk on the side of the road. After a good cleaning with a wire brush and some bleach, we attached them to the wall with lag bolts, right to the studs. All the frames and accessories are again from a thrift store. The chevron wood block I made from left over pieces from my planked Wall. This built-in is the craft/game area, but also my wrapping station, I used tension rods in the center section to put my wrapping paper on. I just pull and cut. I also have bows in the blue bins and all other wrapping supplies in the closed cupboards. I will do a separate post on all the organization and storage later. I have paper, colored pencils and markers here as well, all in bins and containers from thrift stores. I covered the center section with hounds tooth wall paper I found at the Restore. My sister gave me the antlers and I just painted the plaque grey and covered the center of the antlers in grey material and studs. Last of all is the food center. Popcorn bowl is from a thrift store and filled with microwave popcorn. We did buy the microwave new from Walmart. The orange bowls are for popcorn after it's popped; got them at Walmart. We like to eat popcorn when we watch movies. Blue cups were like 10 cents each at an outlet store. I love the look and organization of the area. Can I say I am just in love with them!!! The table makes it easy to wrap presents, play games or draw. Pretty much all the decor in this room is from thrift stores for $1-3 each. Yeah even that chevron pillow, thrift store!! I did however recover an old couch pillow with copper faux leather for the second pillow. Last section was the hallway. 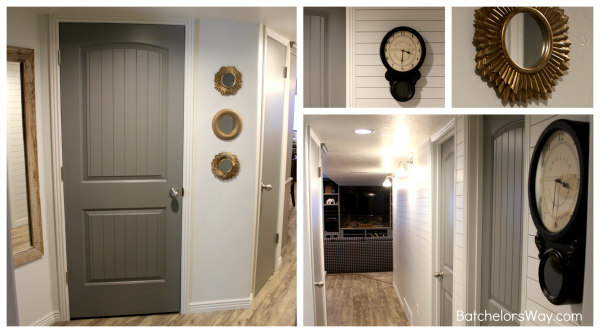 I painted all the doors grey like the built ins. I found a second hand mirror on an online site, mounted to the wall and framed it out with weathered wood I may have pulled out of a dumpster. I added a set of three gold mirrors I collected from thrift stores and the dollar store. Last of all I added a clock I picked up once at a garage sale. 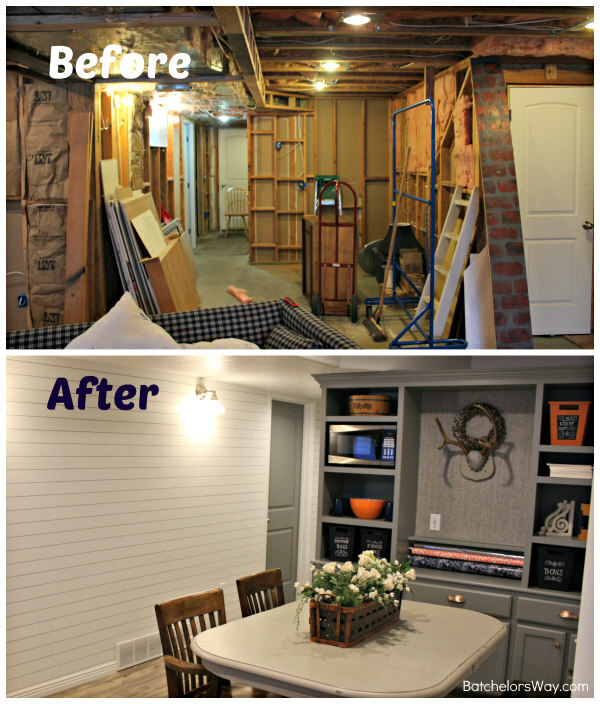 I can't do a room reveal with out before and afters!! Here's the view when you first walk into the basement. And the game/craft area and hall back to the bedrooms!! Here is a list of colors and styles of products we used. 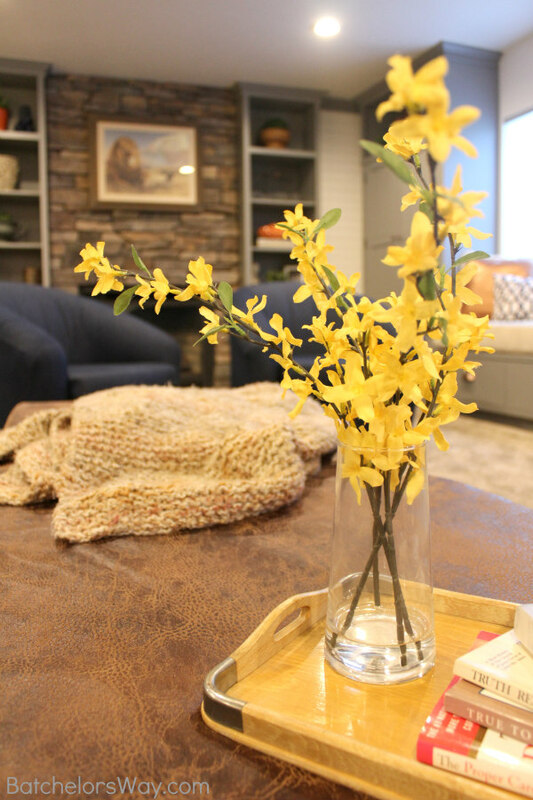 Here are links to all the posts on the basement family room so far. If you just want the look instantly, here are links to products close to those that I used. It's called the easy button. Welcome back! You have been missed. Everything looks wonderful. I love how everything came together. You are inspiring!! What a gorgeous room! 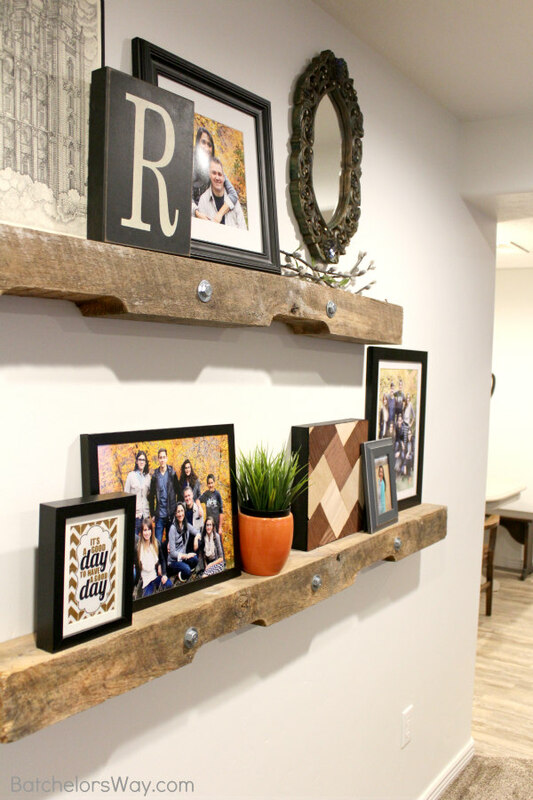 You inspire me to thrift more and check out Restore more! !